I think if you are living in Europe and if you have BBC and you love Baking, I am sure you know about Great British Bake Off I am hooked to the series from the time they started couple of years ago. And it started again with 12 candidates 3 weeks ago and every week I am watching the programme and forcing Hans to watch with me too. And this year I thought I will make something from each series. 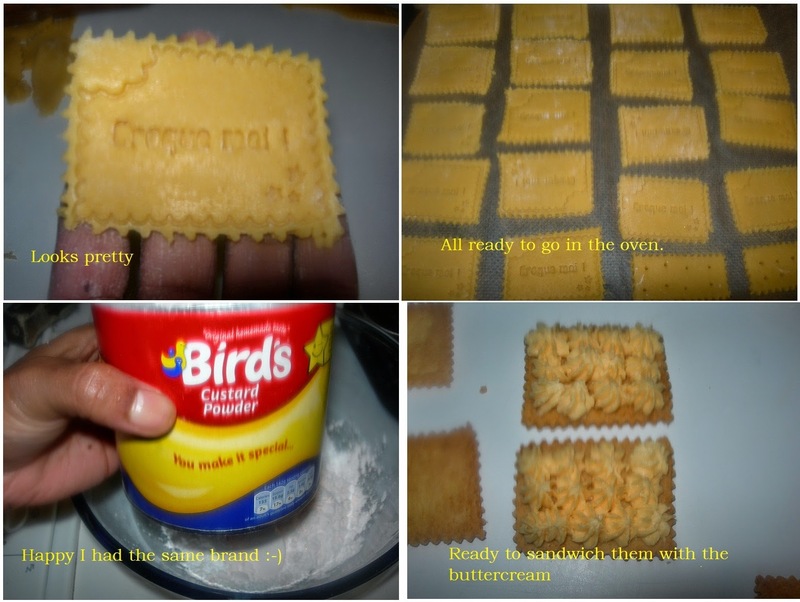 I have made something from the first week, but when I made these custard biscuit and shared the picture in my Instagram and Fb everyone wanted to have the recipe, so I though I better add this recipe first. 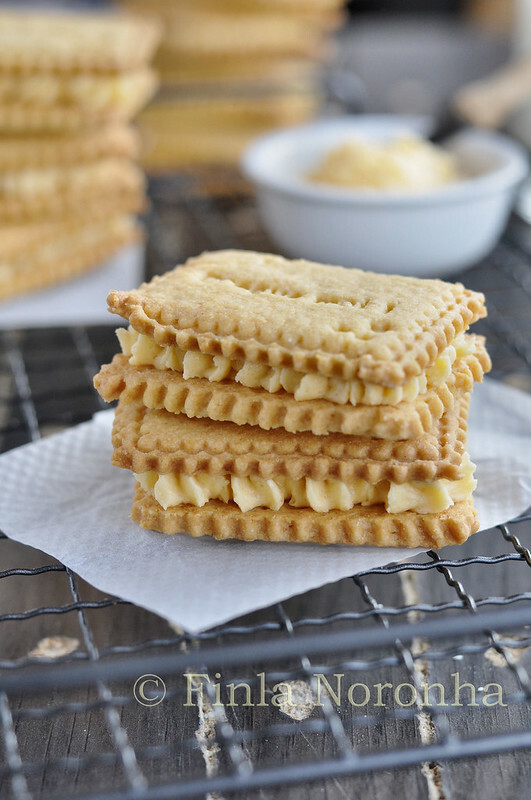 I always loved custard biscuits, even though here in Belgium they are not common, it is common in India and also in England. And every time I go to the British store or when ever I go to UK i pick up few packs of custard biscuits and bourbon biscuits. I must say even though you can buy them cheap, the home made ones are so delicious, once you had home made ones I think you will never buy from shops. I have to say mine lasted 3 days and they were good on the third day too. I don't know how they will taste after that ,if they would be still crunchy as mine didn't last that long. 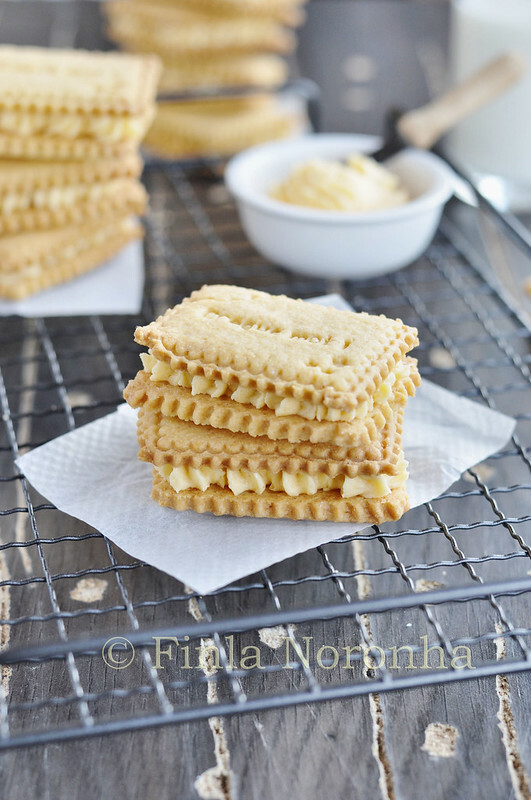 When I saw this Classic Custard Biscuits in one of the many Facebook groups I am in, I knew I will be making them, and asked her were she got the recipe and she shared the link to everyone's delight in the group. Mine baked in 12 minutes. I didn't used the traditional square size, I used my cookie stamper. For the biscuits, put the flour, custard powder, baking powder, sugar and butter into a food processor. Pulse until the mixture resembles fine crumbs. Alternatively, rub the butter into the flour mixture using your fingertips. Add the egg and milk and pulse until the mixture just comes together. Tip on to a work surface, bring together with your hands, then wrap in clingfilm and chill for at least 30 min or up to 1 day. Preheat oven to 180°C (160°C fan) mark 4. Line two baking sheets with baking parchment. Lightly flour a work surface and roll out dough until 3mm (⅛in) thick. Cut it into an even number of 3cm x 4.5 cm (1¼in x 1¾in) rectangles, re rolling trimmings as needed. If you like, mark the rectangles with a diamond and a dot in each corner. Put rectangles on prepared sheets and bake for 13-15 min until lightly golden. Cool on the sheet for 3min, then transfer to a wire rack to cool completely. Meanwhile, put the softened butter into a large bowl and sift over icing sugar and custard powder. Mix to combine (don't add water as it needs to be fairly thick). Set aside. When the biscuits are cool, sandwich together with some of the filling, using a piping bag if you want a neater finish. These biscuits look perfect and beautiful Finla! I am all droooooling over these. Marked this recipe for baking.. These biscuits have turned out perfect, Finla. Do you think I can replace custard powder with cornstarch? 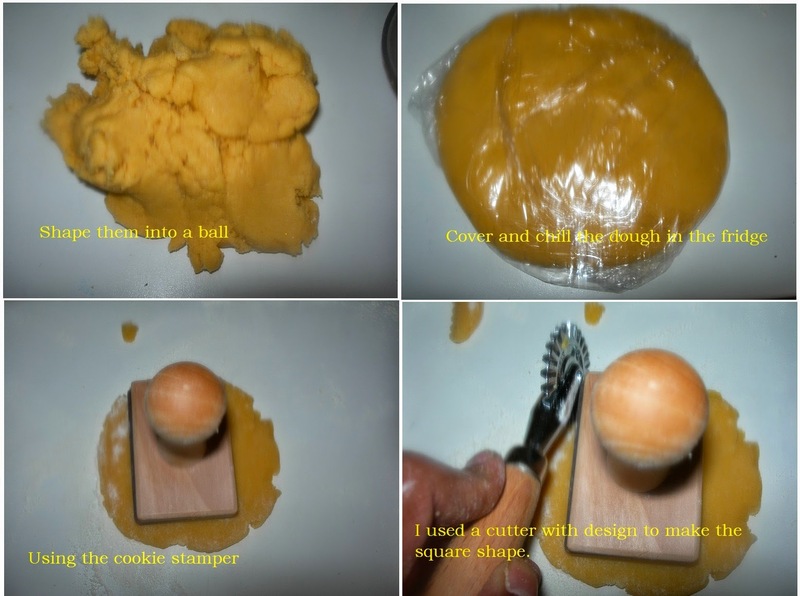 Angie you have to use custard powder can't use corn starch, as it is the custard powder which give the taste to the biscuits and the filling. O these look fabulous Finla... How did it happen that I missed the beginning of the Great British Bake off?? I'm gonna try and follow from now on! Finla, oh my!! Every time I return from a break you have another creation I only wish I could make. 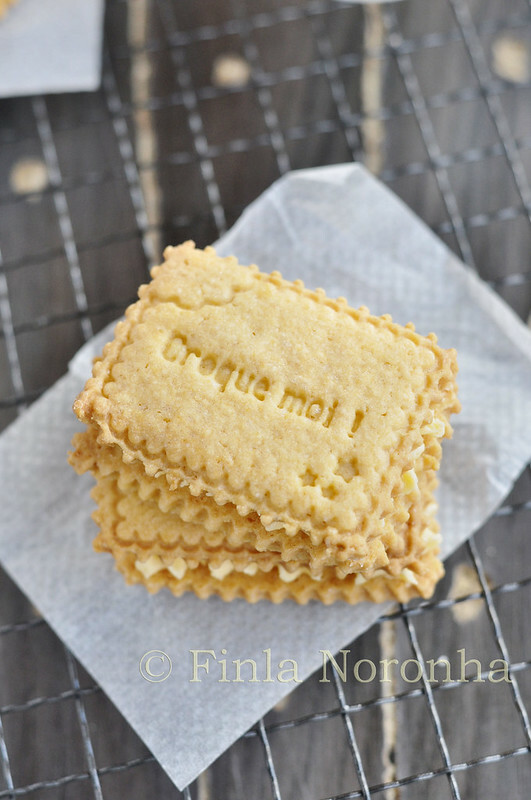 God Finla, these Biscuits look super amazing. I have been a big fan of the show too and really keen to try these. Thank you for inspiring me. Perfectly baked biscuits, you have there. On your blog after such a long time but why no new posts U stopped blogging ? Perfect looking biscuits. so inviting! !